My youngest is becoming more and more like me everyday. It's not just the way that he looks and acts, but the way that he approaches life in general. He makes the sames faces and reacts to situations much the same way that I do. In addition he has a very high metabolism and a huge snacking habit just like me. He literally seems to eat from sun up until sun down. My oldest is also a big snacker, especially when he gets home from school. Due to the fact that my family is full of people who love snacks I try to keep as many healthy snacking options as I can. One snack that my whole family loves is granola. Since store bought granola is so expensive and almost all brands have gluten I have learned to make my own granola at home. Today I tried a new recipe for Chocolate-Pecan Pie Granola from the November 2012 issue of Southern Living. This recipe has 8 ingredients. It takes 40 minutes of total time, 10 minutes of which is active and makes 6 cups of granola. I made considerable changes to this recipe. First off the thought of using butter and dark corn syrup to make granola just wasn't something that sounded healthy or delicious to me. I try to reduce artificial sugars and saturated fat from dairy when I can. So I modified the recipe to work with the ingredients that I already had in my cupboard. First, instead of the butter I used olive oil. I love using olive oil in baking, it is much lower in saturated fat than butter and the texture and taste is similar. Instead of the dark corn syrup I used sorghum. I love using sorghum, molasses or honey in recipes that call for corn syrup. Agave syrup would be another option that would also work. All of these options are good substitutes for granulated sugar or corn syrup in recipes. It was brought to my attention after I wrote this up for the first time that I failed to mention that I modified the wheat germ. I eat gluten free (I have to due to health reasons), so I left out the wheat germ and added a 1/2 cup of brown rice flour. When I added the granola to the pan I pressed it down with a spatula until it was flattened. Make sure to stir the granola every ten minutes or it will burn. I let the granola partially cool and then I broke it into bits and added the chocolate when it was still a little warm in order that the chocolate partially melted. I followed the remainder of the recipe as written. Making all the changes to this recipe worked very well. The sorghum gave the granola a great taste and the olive oil made the granola a healthier breakfast or snacking option. My husband felt that the chocolate pieces were unnecessary, he would like the granola without the chocolate. However, my two boys were big fans of the chocolate pieces, so it would work either way depending on how sweet you want your granola. Overall, a delicious granola recipe that I would make again following my changes. 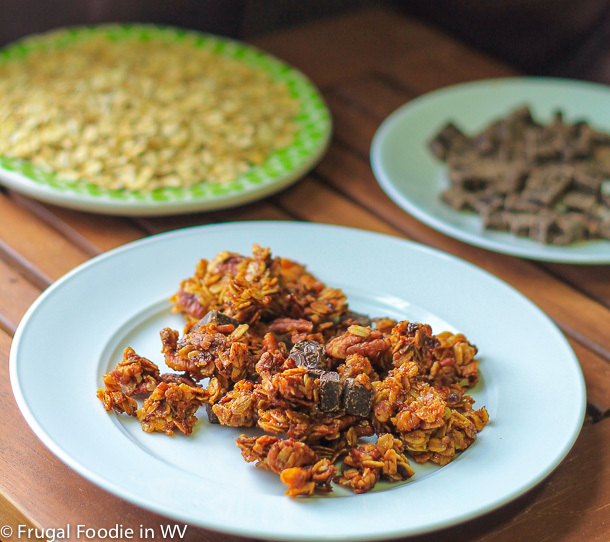 For the recipe go to Chocolate-Pecan Pie Granola. We're all big snackers in our house, too, but I am curious as to whether or not the kids would eat this. I definitely would, though. I am lucky that my kids will eat almost anything that I give them :) The granola really is yummy and I think most kids would eat it! This sounds really delicious! There is a pecan seller at the farmer's market and I've never gotten the chance to buy any from him yet. Here is a great reason! I wish that we had a pecan seller at our farmer's market, that is awesome! Delicious! I am kind of obsessed with granola. I eat it nearly every day! This one looks so yummy. I wish I was that lucky! My 2 year old hardly eats anything at the moment, it's driving me crazy! He does however like granola and this recipe looks delicious! (Just like all the rest of them!) We will definitely be trying this one out!! Both of my two boys went through that stage at 2 also :) Luckily they are both at pretty easy going stages, which I am so thankful for! Thanks for the sweet comments, if you try the recipe tell me how it goes! Question: This is categorized as gluten-free, but it has wheat germ in it. Is wheat germ not gluten? I don't think it would be good for folks with Celiac disease. Help? The original recipe does have wheat germ, I modified it to be gluten free and forgot to write in my changes. I apparently was on auto pilot when I was typing the labels and wrote wheat germ without thinking :) Thanks for noticing, I do appreciate it! Sometimes it's a good thing not to sweat the small stuff :) I have discovered some great changes to recipes based on mistakes!